Rose geranium oil is often confused with geranium oil. In reality, the essential oil of rose geranium and that of geranium could not be more different. Both oils are used extensively in aromatherapy and they both come from the Pelargonium graveolens family of shrubs native to South Africa. Today we will be discussing how to use Rose geranium oil for fleas and tick control. Before we discuss Rose geranium tick repellent recipe, let us study the difference between Geranium oil vs. Rose Geranium oil. Geranium oil is steam distilled from leaves, stalk, and flowers of various Pelargonium species. Rose geranium, on the other hand is made using the Bourbon variety of geranium oils and is heavier, more olive greenish in color and richer than geranium oil. It also has a rosy, sweet, minty and spicy fragrance thanks to the geranoil content in its leaves. Both oils in their pure and concentrated forms have remarkable staying power. Geranium oil is often known as the poor man’s rose. Cosmetic manufacturers use both oils in creams, lotions, shampoos, soaps etc. Rose geranium is certainly more expensive compared to other geranium oils and aromatherapists also recognize this oil’s value owing to superior fragrance and healing power. 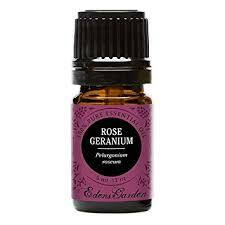 Rose geranium oil blends well with other oils and is great to use in many essential oil blends and recipes. Both oils have tick and flea preventive properties. The study also proved that these oils showed excellent tick repellence, almost comparable to that of DEET, at highest concentration level. Can we safely use rose geranium oil for ticks on cats and dogs? According to the book Holistic Aromatherapy for Animals: A Comprehensive Guide by Kristen Leigh Bell the oil from different Pelargonium species can be safely used on pets. In fact; the author states that Geranium and Rose Geranium oils must be made a part of every pet owner’s apothecary. Not only does it repel ticks and fleas; it is also antifungal. She recommends adding the oil to bath water while bathing pets and to use it to keep their environment tick free, clean and fresh. Where to buy rose geranium oil? There are many good brands of essential oils and you can buy them online. If you decide to buy from a shop, choose one that is concerned with health rather than perfume stores or bath and body shops. Select a brand that sources its raw materials from sustainable sources and also guarantees third party testing of their oils. Essential oils do not have any standards of testing so you must source them from brands recommended by neutral or third party testers. When you are planning to use an essential oil for the first time around pets, you must always ensure that it is safe to do so and that they are not allergic to the oil. Always dilute the oil in coconut or olive oil prior to using it topically on your pet. The best way to use rose geranium tick repellent recipe is in the pet’s shampoo or in the final rinsing water after bathing. You can also apply a few drops of the concentrated oil on a handkerchief and tie it around the pet’s neck. This remedy is particularly useful when you walk your dog along grassy trails where ticks usually live. You can also apply a few drops of the oil in between the pet’s shoulder blades or at the base of the tail where the animal cannot lick it. Reapply every few days for continuous tick repellence. Fill all the ingredients in an empty, clean spray bottle. Spray all over clothes and shoes before going on hikes on grassy trails. You can also spray your pet with this safe, gentle rose geranium tick repellent recipe. Does Coconut Oil Repel Ticks on Humans?